Great traditional jazz arrangements featuring Judie Cochill on vocals, Yamaha artist Ron Kischuk on trombone, Johnny Trudell on cornet, Gene Parker on clarinet, Marion Hayden on bass, Chuck Shermetaro on piano and Bill Cairo on drums. 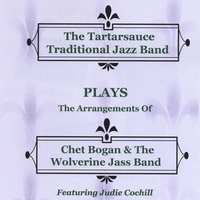 The Tartarsauce Traditional Jazz Band tribute to Chet Bogan's Wolverine Jass Band features the arrangements of the latter. These arrangements have been featured at the Sacramento Jazz Festival, the Bix Beiderbecke festival in Davenport, Iowa and the Montreux/Detroit Jazz Festival just to name a few. The Wolverine Jass Band had one of the longest running gigs in Detroit history (20 years), and these arrangements highlight this traditional style of music. The Tartarsauce traditional Jazz Band is a staple of the Detroit music scene. They are the "Official Band" of the Detroit Tigers, featured performers at the Greenfield Village Ragtime Street Fair, and featured band at the Michigan Jazz Festival. This version of the group boasts Yamaha performing artist Ron Kischuk on the trombone and as leader of the group, the legendary Johnny Trudell on the cornet, Gene Parker on the clarinet and Judie Cochill on vocals. The superb rhythm section is comprised of Marion Hayden on the bass, Chuck Shermetaro on the piano and Bill Cairo on the drums.